▸ Can I come for a tour? YES! We would love to show you around our facility and answer your questions. You don't need to make an appointment. Just stop by during our open hours Monday-Saturday from 9a.m.-12noon and 4-7p.m. We are open on Sundays from 4-7p.m., but we do not offer tours. Please don't bring your pet with you because touring past other guests at the kennel might be a little noisy and more intimidating than helpful. ▸ What is required to board my pet? Your pet must have the following current vaccinations. For dogs (Bordetella, Distemper, Rabies and starting March of 2019, Canine Influenza). For cats, Rabies and Distemper. Your pets must have a friendly temperament, be in good health and parasite-free. You will need to provide us with your pet's proof of vaccination and the easiest way to do that is to ask your veterinarian to fax the document to us. You can fax or email the information as well, as long as it is on official stationery from a licensed veterinarian. Unfortunately, we cannot accept handwritten info from breeders, and we also do not accept vaccinations that have been purchased and given by owners. For more detailed information about requirements and restrictions, especially for puppies and kittens, please refer to our POLICIES & FAQs section. ▸ What are your check-in and check-out times? We are open Monday-Saturday from 9am-12noon and 4pm-7pm. On Sundays, we are open 4pm-7pm only. You may check in or check out any time during our open hours. Do you offer after hours pickup or drop-off? We do! After hours pickups or drop-offs are by appointment only. Please call during normal business hours to schedule. There will be a $50 charge per pet added to your bill for this service. ▸ What if my pet has medication or special diet? Keeping your pet happy and healthy is very important to us! If your pet needs medication during their stay, please make sure to bring the container that the medication was dispensed in (whether it's prescription or over-the-counter) so we know the name, dosage and milligrams of what we are giving in case there is an emergency and we could not get in touch with your vet. Also, it is a good idea to bring enough medication for an extra day or two in case you cannot get back on your scheduled departure date. If you give your pet medication in a special treat or food, please provide that so we can keep your pet on a familiar routine. There is a nominal charge per day for medication. We do not give injections of any kind, and we suggest you contact your vet to discuss the best option for boarding for your pet that needs injectables. If your pet has a special diet, such as raw or frozen food or prescription kibble, we can accommodate most requests. We feed our guests a morning meal and an evening meal; however, we can provide a mid-day meal for a nominal charge. If you have any questions or concerns about your pet's diet, please give us a call so we can discuss options. ▸ What happens if my pet has a medical emergency during their stay? Your pet is monitored daily to make sure they are happy and healthy, but sometimes unexpected events happen that require medical attention. If your pet needs emergency care, we make every effort to get in touch with your veterinarian first, and then we make the call to you. If we cannot get in touch with your vet, we will contact a local vet who has made themselves available to us for after-hours questions and care. If the emergency is life-threatening (or your vet feels they cannot handle the issue in their office due to the urgency), then we will transport your pet to MedVet, a 24-hour emergency care facility just south of Dayton. Please feel free to discuss this protocol with us when you check in if you have any concerns. Also, please make sure your emergency contacts in your profile are current, as these are the numbers we will call in case we cannot get in touch with you. ▸ How can I make a reservation? How far in advance can I make a reservation? Reservations can be made at any time (even a year in advance!) by simply calling us at 937-962-5328 and speaking with one of our friendly and knowledgeable Reservation Specialists. If your plans include a holiday, summer, or any time school is not in session, then we advise reserving your dates early! We can also answer your questions and concerns, and discuss what items you will need to bring for your pet to make their stay with us even more comfortable. We also will need the proof of vaccination prior to your arrival, and you can ask your vet to fax that to us. * Reservations requiring a deposit are not entered into our system until the deposit is made. ▸ Do I need to make a deposit to hold and confirm my pet's stay? NO deposit required if your pet's stay does not include a major holiday or you are not requesting a Luxury area (see below). We take your reservation in good faith that you will board your pet with us during that time frame. We do understand that issues come up and you may have to cancel a reservation. Kindly give us as much advance notice as possible so that we may open the space up for others. YES, a deposit is required if you want to reserve The Lodge, The Loft, The Penthouse or The Tudor Mansion any time during the year (including holidays). The deposit equals the cost of one day's stay ($49 or $55) and is non-refundable. YES, a deposit is required if you want to reserve a lodging space for dates that include a major holiday- Easter (Friday-Monday), July 2nd—July 6th, Thanksgiving (Wednesday-Sunday) and December 23rd—January 1st. Holiday deposits are non-refundable. (Just remember that all deposits are non-refundable if you cancel the reservation at any time; however, if your pet stays at the Resort as scheduled, then your deposit is credited to your account when you check out). 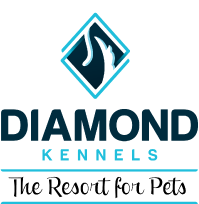 ▸ Is Diamond Kennels open on holidays? We are closed to the public on Easter Sunday, July 4th, Thanksgiving day, December 24th (p.m.), December 25th (all day), December 31st (p.m.), and January 1st (a.m.). Our staff works 365 days a year to take care of our guests! ▸ How and when do I pay for my pet's stay at Diamond Kennels? You pay for your pet's stay when you pick up. We bill each stay like a hotel. You pay for the day you drop off your pet regardless of the time. If you pick up your pet between the hours of 9am-12noon (except on Sundays), then you are not charged for that day; however, if you pick up between 4-7pm, then that day is added to your bill. Morning pick up is not available on Sundays so there is an automatic charge for that day. We accept Visa, Mastercard, Discover, local checks and cash. ▸ What is your cancellation policy? We make your reservation without a deposit (unless it is during a holiday or for a luxury suite) in good faith that you will use it. We understand that sometimes circumstances may cause the need to cancel, so we respectfully request as much notice as possible so that we can make the space available to others. In the case of a cancellation of a reservation that requires a deposit, then the monies paid are not refundable. ▸ Can I bring my pet's food? YES! We prefer that you bring your pet's own food. Being away from home can cause some stomach distress, so it important to keep your dog or cat on their regular diet. We can provide food, but there is a daily charge to do so. If you feed dry kibble, we prefer that you bring the kibble in individual baggies for each meal, but you can also bring a bag or container of food instead. Please do not bring large trash cans or storage boxes, as those are difficult for us to store. You don't need to bring bowls or anything to measure food- we have all that at the kennel. Just make sure you know how much (standard kitchen measuring cup) food your pet eats each day. If you have canned food, please let us know how you want that given. Make sure you bring a little extra food in case you cannot pick your pet up on the schedule departure day. If you free-feed your pet, please overestimate the amount of food your pet might eat during their stay. We would rather have too much food than not enough!! ▸ Can my pets be fed separately? YES! We prefer to feed pets separately so that there is no intimidation or fighting over food. ▸ What if my pet runs out of food during their stay? For a nominal charge per day, we can feed your pet "our" food. Keep in mind that this will be an immediate 100% change in food for your pet, and many times that causes digestive issues, such as diarrhea, especially when your pet returns home and goes back to their usual kibble. If we know the brand and flavor of your pet's food, we can purchase an additional bag, and include the price of the purchased bag (along with a pick up charge) on your bill. ▸ My pet just eats when he/she wants to. Can you do that during their stay? YES! Some animals can self-regulate their consumption of food, so if your dog or cat has access to food all day, then we can do that. We call it free-feeding. ▸ What happens if my pet does not eat during their stay? If your pet is a picky eater at home, then it would not be surprising if they were the same here! It is not unusual for your pet to ignore food for their first day with us; however, we monitor food intake for all of our guests, so if your pet is not eating after that first day, our staff will take measures to encourage your pet to eat, such as moistening food, hand-feeding, moving bowls, adding crumbled treats to kibble, etc. In most cases, once your pet adjusts to our schedule and staff, they will also start eating. If your pet refuses to eat at all, then we will contact you for advice. ▸ I got more food back than I expected when I picked my pet up. How do I know my pet ate? See answer above, but if you are still concerned, please ask us for more info about your pet's food consumption. Our staff monitors the daily food consumption of each of our guests, and documents those that are not eating at all, not eating entire meals or occasionally skipping a meal. We would be happy to share that information with you so you have a better understanding of your pet's eating habits while they are here. ▸ What time does my pet get fed? Our staff begins preparing meals around 9am and again around 6pm. When you check in, we will complete (or review) your pet's kennel card which has detailed feeding instructions about the amount and frequency of your pet's meals. Please make sure this information is accurate. If your pet has access to food all the time (free feeding), then at each meal time, our staff will make sure your pet's bowl has an appropriate amount of food in it. If you feed your pet a mid-day meal, we can accommodate that request for a nominal fee. ▸ Can I bring treats for my pet? ABSOLUTELY! We want to try to spoil your pet as much as you do (although you have raised the bar very high!) so that means having their favorite treats from home. We do have some yummy treat options from our Room Service Menu as well. ▸ How often does my dog get outside for potty breaks? We can customize the amount of time your dog stays outside, especially for older or smaller dogs. Let us know when you check in. ▸ If it's very cold or raining or snowing, does my pet have to stay inside with no breaks? NOPE! The fun never stops at Diamond Kennels! Unlike most kennels, our guests always get time out of their lodging areas for exercise, a change of scenery, and potty breaks, no matter what the weather is like outside! All the breaks are from 20 to 60+ minutes each time* (depending on the weather) because we want your pet to have plenty of time to do their business and stretch those legs. If it is too cold, too hot, snowing or raining, then your dog gets their exercise in our enclosed or indoor areas. We never miss a chance to have fun at Diamond Kennels!! ▸ What happens if my dog does not like to interact with other dogs? We never put your dog in a play yard with other dogs unless you give us permission to do so. All of our guests get their break times in individual runs unless you choose to review and sign an agreement for Socialization. ▸ What if my dog loves to play with other dogs? If your dog is a Party Animal, then let us know when you check in! You can sign your dog up to participate in Socialization for a daily fee. All our social guests go outside 4 times each day in our huge play yards, and we have 4 different groups depending on the size and play style of each dog. That helps keep everyone safe and happy! ▸ What if I want my dog in a play group, but it doesn't work out? Sometimes not everyone gets along, so if we need to remove your dog from socialization, he/she will still get 4 breaks each day (but in our individual runs). ▸ What is the difference between Playtime and Socialization? Playtime is a one-on-one play session with a staff member which lasts 15-20 minutes. Whether your dog likes to play tug or fetch or just wants some cuddles and attention, our staff will provide that during Playtime! Socialization means your dog participates in one of our 4 play groups with dogs his/her own size and play style. Our social dogs go outside 4 times a days in our huge play yards for 30-60 minutes (or more, if the weather is nice!). Social dogs must "play well with others", and pet parents must sign an agreement and give permission for play group participation. All social dogs must be neutered or spayed. ▸ Does my dog have to sleep on the floor if I don't reserve a luxury room? Certainly NOT! Every one of our guests has access to a bed or cot in their run. The cots are Kuranda brand beds, and they have a trampoline-like surface so your dog will have something comfortable to sleep on every night. You may bring a small washable quilt or blanket for added comfort. Please, no foam beds or bedding without a removable cover. ▸ How often is my pet's room cleaned? Every single lodging space and bowls are thoroughly cleaned EVERY morning so your pet has a fresh area to start each day! Our staff also spot-cleans throughout the day in case there are any accidents. Any soiled bedding is removed and washed as well. Kitty spaces are cleaned twice a day, including litter pans. All water bowls are refreshed several times each day to ensure that your pet stays hydrated with fresh, clean water. ▸ What happens when I check my pet in that first day? DOGS: Upon arrival, you will be greeted by one of our staff members, and after saying your good-byes, your dog will be escorted to an outside run while you check in. If the weather is bad that day, then we will use our indoor exercise runs. Many times the anxiety of a car ride and the excitement of coming to the kennel will cause your dog to have to potty, so it is much less stressful for them if they are outside as soon as they arrive at the kennel. CATS: Upon arrival, you will be greeted by one of our staff members, and after saying your good-byes, your cat will be taken to Kitty City where he/she will be placed into their condo. You may accompany our staff member and assist with the transfer of your cat into the condo if you wish to do so. Fresh water (and food, if needed) will be placed in the Condo, and then you can proceed to the counter to check in. ▸ What can I do for my pet to take away some of the stress of coming to the kennel? We know that leaving your pet under someone else's care can cause some anxiety for pet owners! But it is best to keep an upbeat attitude when dropping off your pet so they don't sense that you might be upset. Say your good-byes before arriving, so a quick kiss and a hug is all that is needed when we take your pet into their room. Just remember that cats and dogs adjust to different circumstances much quicker and easier than humans. It doesn't take very long for your pet to get used to our routine. Our staff will make sure your pet is comfortable and happy from the start (and will certainly give a little extra TLC to those that might take a little more time to adjust). ▸ Can I call to check in on my pet? ABSOLUTLEY! We want you to enjoy your time away, and knowing that your pet is eating well and having a good time helps make your trip better. If we cannot get to the phone when you call, always leave a message so we can call you back as soon as possible. We can't stop you from missing your pet, but we can help you from worrying! ▸ My dog is older. Do you have any areas that are quieter and have easy access to outside? YES! We have a Senior Room available for pets who are older and less mobile. It is located in a quiet area of the building and does not require your dog to maneuver any steps to go outside. ▸ What can I expect when my pet comes home after boarding? Naturally your pet will be very excited to see you (just as you are excited to see them!). But don't be surprised if your pet is tired and lethargic for the first few days. Their appetite may not be normal either, but this might be because they are tired. During your pet's stay with us, their schedule was probably more active than when they are home. Our staff arrives at 7am and leaves around 8:30pm, and there is something going on the whole time. It's hard to get quality sleep! You know how it is when you are away from home for a few days- it can be exhausting! But you know your pet better than anyone else, so if you are concerned that your pet is more than just tired, please give us a call so we can check to see if there were any issues with your pet's eating and exercise habits. And you might want to touch base with your vet for advice, especially if your pet is older. ▸ Do you accept "bully breeds" for boarding? Yes and no. If you are interested in boarding your dog who falls in the category of "bully breeds" (pit bulls, pit mixes, Am. Staffs, Boerbel, Cane Corso, etc. ), we respectfully ask that you arrange for a "Meet and Greet" prior to your requested boarding dates so we can do a temperament test with your dog to make sure we are a good fit. We rarely come across a dog that does not pass this test, but we want to make sure our environment is comfortable for your dog so there are no unexpected issues during their stay. It might also be noted that we do not accept ANY breed of dog that shows aggression towards humans or other animals while at the kennel.